This article or area is currently under construction and may only be partially complete. Please come back soon to see the finished work! Posterior knee pain is a common patient complaint. Knee pain is more common in the anterior, medial, and lateral aspect of the knee than in the posterior aspect of the knee. The differential diagnoses for posterior knee pain include pathology to the bones, musculotendinous structures, ligaments, and/or to the bursas. Less common are neurologic and vascular injuries. Also tumours, such as a begin tumour that contains both bone and cartilage and usually occurs near the end of a long bone (osteochondroma) or bony tumours. Tenderness of palpation over the tendons or muscles in the back of the knee can indicate muscle or tendon injury. Pain or swelling in the popliteal area suggests an effusion or cyst. A precise understanding of knee anatomy, the physical examination and of the differential diagnosis is needed to accurately evaluate and treat posterior knee pain. The anatomy of the knee is important when evaluating posterior knee pain. There is a complicated network of muscles, ligaments, and other soft tissues around the knee that contributes to the structure and support of the joint. These include both passive and active stabilizers. 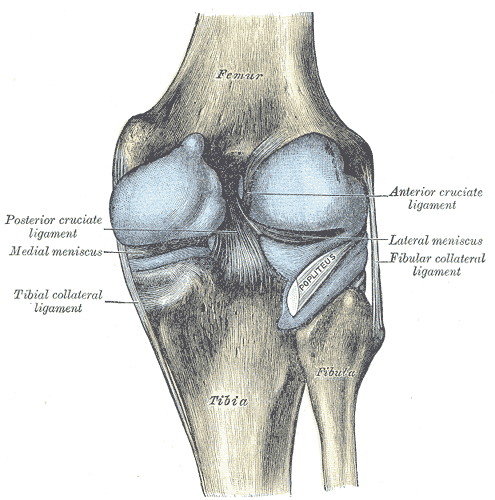 Examples of passive stabilizers include the medial collateral ligament (MCL), lateral collateral ligament (LCL), anterior cruciate ligament (ACL), and posterior cruciate ligament (PCL), while examples of active stabilizers consist of the hamstrings, extensor mechanisms, and the popliteus muscle. Gastrocnemius and the hamstring complex are two sets of muscles important in posterior knee anatomy. The hamstring muscle group consists of the medially located semimembranosus and semitendinosus and the laterally located biceps femoris. It is also important to note the anatomy of the popliteal fossa when evaluating posterior knee pain. The popliteal fossa is also composed of nerves (posterior femoral cutaneous, common peroneal and tibial), vascular structures (small saphenous vein, popliteal artery and popliteal vein), bursae, lymph nodes, and fat. The bursae of the knee are synovial-lined sacs that decrease the friction of moving structures. Pain and swelling of the bursa are caused by inflammation, external pressure, or overuse. The semimembranosus tendon is a part of the posteromedial joint capsule, which is important in controlling anteromedial rotatory instability. (Together with the pes anserinus tendons it gives medial and posteromedial reinforcement.) There is a U-shaped bursa that surrounds the distal SM tendon, separating it from the medial tibial plateau, medial (tibial) collateral ligament (MCL), and semitendinosus tendon (surrounding structures). There is a large variety of potential causes of posterior knee pain. Tendon injuries are associated with repetitive mechanical stresses that cause degenerative lesions. Hamstrings, gastrocnemius, and popliteus tendon typically cause posterior knee pain. The hamstrings are frequently injured in sports that require sprinting. Semimembranosus tendinopathy usually presents as an aching pain localized to the posteromedial knee with tenderness on palpation inferior to the joint. Some of the possible risk factors for hamstring injury include body mechanics, flexibility, balance, hamstring strength, improper warm-up, fatigue, specific activities, running techniques, and psychosocial factors. The gastrocnemius muscle’s superficial location and action across the knee and ankle make it susceptible to injury. Pain in the gastrocnemius occurs during knee flexion with resistance and during calf raises. The popliteus muscle can also be a significant source of posterior knee pain. Both the muscular and tendinous aspects of the popliteus can be injured. Injuries to the popliteus may promote injuries to other structures in the postero-lateral complex and to ligaments of the knee. The mechanism of injury is thought to occur from direct stretch or when overused to maintain posterolateral stability. Guha et al. suggested that a stable knee with posterolateral pain and hemarthrosis on exam indicates a rupture of the popliteus tendon. Injury to the common peroneal nerve is seen with posterolateral knee injury. Posterolateral complex injuries can be seen along with ligamentous injury (PCL) leading to cause pain. A medial meniscal tear can cause a catching sensation in the knee and rarely presents as posterior knee pain. A tear in the posterior part of the meniscus can also cause pain behind the knee, particularly when straightening the knee, epecially after sitting or squatting for a while, as the torn part of the meniscus can get caught in the joint. Bone pain can rarely cause posterior knee pain. Bone pathologies include degenerative bone disease, tibial stress fractures, and bone tumors. Bone tumors are a rare cause of pain that can be difficult to diagnose. Besides bony tumors of the knee, some other tumors can also cause knee pain. These tumors include osteochondromas, osteosarcomas, chondroblastomas, endochondromas, synovial chondromatosis, and pigmented villonodular synovitis. Recently, an angiomyomatous hamartoma has been described as causing posterior knee pain. This angiomyomatous hamartoma was in a single popliteal lymph node that caused posterior knee pain. Injury to bursae is usually the result repetitive motions and will elicit pain and tenderness. Cystic lesions of the knee can be caused from a diverse group of entities from benign etiologies to complications of arthritis, infection, and malignancy. The classic cystic lesion causing posterior knee pain is the Baker’s (or popliteal) cyst. A Baker’s cyst is caused either by a herniation of the synovial membrane through the posterior capsule or by an escape of fluid through an anatomic bursa next to semimembranosus or gastrocnemius. Fluid seeps in to the popliteal bursa, located at the back of the knee causing it to swell. It often feels like a squashy orange. A Bakers Cyst typically causes pain behind the knee when bending the knee as the bursa gets squashed. These include popliteal artery entrapment syndrome, aneurysms, and deep venous thrombosis (DVT). There is minimal literature available on neurological causes of posterior knee pain as there are few case reports, randomized control trials, or meta-analyses that discuss the neurological causes of posterior knee pain. However, referred pain has been implicated as a cause of posterior knee pain. The patellofemoral joint and lumbar spine may both refer pain to the posterior knee. Pain can also be caused by entrapment of nerves in the popliteal fossa. This is an uncommon cause of chronic posteromedial knee pain that more often occurs with older patients. It may be underdiagnosed or inadequately treated because of a lack of understanding of the condition. But timely diagnosis can lead to effective treatments. Although tendinopathy may occur in any of the hamstrings tendons, the semimembranosus tendon is the most commonly affected. It may occur as a primary phenomenon in endurance athletes or as a secondary, overuse, compensatory condition from a primary knee abnormality, such as patellofemoral disorders. SMT usually presents as an aching pain localized to the posteromedial knee with tenderness on palpation inferior to the joint. The pain is severe in its acute form, but symptoms increase with activities that involve significant hamstring activation: running, cycling, walking down stairs, climbing, or sudden deep knee flexion. Characteristics of the hamstring strain. Main symptoms are, a sudden sharp pain during sports activities, it can also be described as a tearing impression, and tightness, weakness and impaired range of motion. - Injection(s) of 3 mL of 2% lidocaine and 10 mg triamcinolone at the insertion site can be effective in relieving the symptoms. - Surgery to reroute and reattach the tendon is rarely needed but may be effective. In more than 90% of the cases, this condition will heal without further intervention. 1. Initial conservative treatment includes relative rest, ice, pain-relieving modalities, a short course of NSAIDs, and physical therapy that includes hamstring strengthening and stretching exercises. Hamstring strain - RICE-method: rest, ice, compression and elevation to speed the recovery. After the acute stages, heat can be used such as hot packs, whirlpool or heating before the stretching exercises. All the activities should be followed by ice-treatment to decrease inflammation and discomfort. -The first phase (level of evidence:5): the athlete begins pain-free submaximal isometric strengthening at multiple angles. -Exercise: The athlete completes a set of isometric contractions at 30°, 60°, and 90° of knee flexion by placing the injured limb on top of the contralateral limb and contracting the strained hamstring. The hamstring should not be stretched into a painful range at this time but available hip and knee ROM should be maintained. Motion is also good for aligning fibres and increasing the strength of the lateral adhesion of fibres, which protects the injured fibres from stump separation. The goals of this stage are to normalize gait and to obtain knee flexion strength at greater than 50% of uninjured length upon manual muscle testing at 90 degrees of knee flexion. -Isometric knee flexion in the seated position. Note that this would be performed at multiple angles. - The second phase (level of evidence:5): The athlete progressively regains strength throughout the ROM and improves neuromuscular control of the hips and pelvis in preparation for sports specific movements. End range lengthening should be avoided if painful in this stage. Exercises: Eccentric training can be achieved using an isokinetic dynamometer if available and performing exercises such as straight leg deadlift, single leg windmills and the Nordic hamstring exercise. The patient stands with the uninjured leg on a chair or fixed surface and reaches down in a diagonal plane while keeping stance leg straight and maintaining lumbar lordosis. It can be performed without (early) weights and progressed by using hand-held weights or kettlebells, as shown. Having the clinician holds the patient’s feet, while in tall kneeling, performs the Nordic hamstring exercise. The patient slowly falls forward while maintaining neutral hip posture until he or she can't control descent any longer and then pushes back into starting position with upper extremities. At the completion of this phase, the athlete should have full strength upon manual muscle testing (5/5) or be within 20% of the uninjured leg in the zero to 90° range when measured with a hand-held or isokinetic dynamometer in order to progress to the next phase. The athlete should also be able to jog both forward and backward without pain at a moderate speed at this point. - The third phase (Evidence level:5): Focus is on functional movements and eccentric strengthening in the lengthened state. Plyometric and sports specific training may be initiated as well as advanced balance exercise. Alternative lengthened state eccentric training may also be achieved without a dynamometer by keeping the involved thigh on the subject's chest while resisting an outside force with an elastic resistance like a thera-Band, cable column, or manual resistance. Lengthened state eccentric training on the Biodex. Using a setup, the Biodex may be modified so that the patient is in hip flexion and then passively extends and flexes the knee into the end range of motion. The patient resists the passive motion as the knee is extended. Lengthened state eccentric training on cable column. This exercise may be performed by having the patient lay supine pulling knee snugly into chest while hooked up to cable column or elastic resistance. The patient then uses his or her arms to pull the knee into flexion and then slowly eccentrically resists the cable or elastic band as it pulls the knee into extension. At the completion of this stage, the athlete should have full strength throughout the range of motion and should be able to confidently perform all sport-related tasks without limitation. Posterior knee pain can also be referred pain, such as from ☃☃intra-articular hip pathology, lumbar facet arthropathy, sacroiliac joint dysfunction, and sacral radiculopathy. Or it can be caused by peripheral neurological injury and entrapment of nerves in the popliteal fossa. ↑ 1.0 1.1 1.2 1.3 1.4 1.5 1.6 1.7 English S, Perret D. Posterior knee pain. Current reviews in musculoskeletal medicine. 2010 Oct 1;3(1-4):3-10. ↑ SANDRA J. SHULTZ, PEGGY A. HOUGLUM EN DAVID H. PERRIN. Examination of musculoskeletal injuries, third edition, Human Kinetics, 2010, 696 pages. ↑ OHN C. GRIFFIN, Client-centered exercise prescription, Human Kinetics, 1998, 263 pages. ↑ STEVEN J. FLECK, WILLIAM J. KRAEMER, Designing resistance-training programs, second edition, Human Kinetics, 1997, 275 pages. ↑ 9.0 9.1 DANIEL LORENZ, MICHAEL REIMAN, The role and implementation of eccentric training in athletic rehabilitation: tendinopathy, hamstring strains and ACL reconstruction, pubmed, march 2011, http://www.ncbi.nlm.nih.gov/pmc/articles/PMC3105370/, 27/11/2012, (evidence level 5). ↑ 10.0 10.1 10.2 10.3 BRANDON SCHMITT, TYLER TIM AND MALACHY MCHUGH, Hamstring injury rehabilitation and prevention of reinjury using lengthened state eccentric training: a new concept, pubmed, June 2012, http://www.ncbi.nlm.nih.gov/pmc/articles/PMC3362981/, 27/11/2012, (evidence level 5).